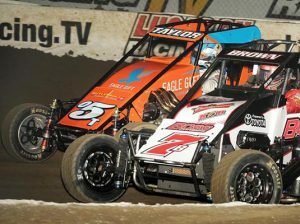 TULSA, Okla. – The 31st annual Lucas Oil Chili Bowl Nationals presented by General Tire has reached a record number of entries only weeks ahead of the event at the Tulsa Expo Raceway in Oklahoma on Jan. 10-14. The 30th annual Lucas Oil Chili Bowl Nationals presented by General Tire set the previous record mark at 349 entries, but the 31st edition just smashed that record at 358 entries with even more still expected. Entries can be accepted all the way up until the final preliminary night on January 13. The question now, is can the attendance record of 335 be broken? The mark was also set during the 30th annual event. Among the latest round of entries includes some of sprint car racing’s royalty like Jac Haudenschild. He is scheduled to pilot the JFM No. 73x again in January. He is also among the few father/son combination in this year’s Chili Bowl as Sheldon Haudenschild will wheel a ride for Mike Larson/Keith Kunz Motorsports. Haudenschild is one of 57 past feature starters that currently populate the list of Golden Driller hopefuls. Of the 358 entries, 19 of those are still looking for drivers. One of the most notable is Loyet Motorsports, who found the original driver of one of their No. o5 machines was not going to be able to make the trip. Also on the that list is Clauson-Marshall Racing, Frank Manafort, Fisher-Hartman, Swindell, Mounce, RayPro Motorsports, and Felker, just to name a few. While the list of Chili Bowl veterans continues to read like a Hall of Fame induction, the list of rookies is grown at a rapid pace as well as 71 drivers will take their first swing at mastering the Tulsa Expo Raceway. Added recently was Georgia’s Jonathan Davenport. A product of the world of dirt late model racing, Davenport is a true midget rookie, though that doesn’t seem to be stopping the 2015 Lucas Oil Late Model Dirt Series champion. In 2016, Davenport racked up 10 wins with the Lucas Oil-backed series, including the $40,000 to win Silver Dollar Nationals at I-80 Speedway in Greenwood, Neb. Davenport will be racing for Zach Daum who, along with racing himself, is again providing the Tony Elliott Memorial car that was awarded to David Gravel. The qualifying night list is scheduled to be released on Dec. 27.